You might all know about this already. My memory is so... how shall I put it... so... so-so. If a Facebook application from Ancestry is old news to you, forgive me. But as near as I can recall, there has been no official announcement. It's been out there for weeks and I've sat on the story, waiting for either official announcement or public comment from someone that stumbled across it. This week, officials at Ancestry gave employees permission to tell friends and relatives. 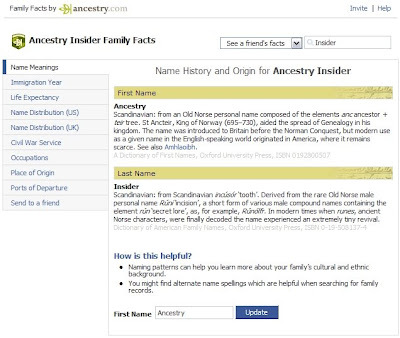 Ancestry's foray into the Facebook space is "Family Facts." 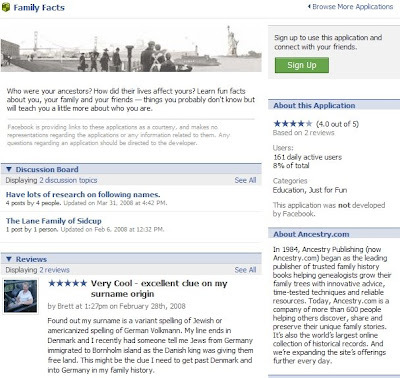 Experienced Facebook users will search for "Family Facts" in the box on the upper-left. But then there are Facebook users like me, who had this show up on "my wall" soon after joining. Experienced Ancestry users will recognize Family Facts as a free feature of the Ancestry website available at the bottom of the main Learning Center page. Family Facts present various information about your surname, most of which has been culled from Ancestry's genealogy databases. See the list of available facts in the image above on the left. If you were hoping to display part of your Ancestry Member Tree, your research interests or a tool that helped you connect to relatives or fellow researchers, then you will be disappointed in this application. 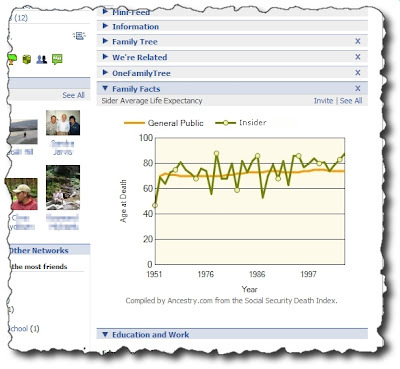 But if you'd like a little graphical something to add a little pizzazz to your profile while displaying some interesting tidbit about your surname, then you may find Ancestry's Family Facts to your liking. More information about Family Facts is available in an Ancestry Magazine March 2006 article and in a 24/7 Family History Circle September 2006 article by George Morgan. In November of 2006 Ancestry announced print-on-demand surname books called Our Name In History that makes use of Family Facts as well as other information. The website OurNameInHistory.com explains more about these books. A year later on-demand publisher BookSurge announced it had partnered with Ancestry to offer the quarter-million titles in the Our Name In History series on Amazon.com. The list of available titles shows the books have received mixed reviews. Some bad reviews seem to assume the books are repeats of the fraudulent Halberts books which contained 1 page falsely presenting a coat of arms as belonging to the surname, 5 pages of generic history and 100 pages of phone book listings. For example, a man named McGonigle wrote a bad review of the Jones book. (Maybe his mother was a Jones.) He called it a total fake, "about as valuable as opening the telephone book and making a list of all the Jones people in it." A full 33 of 35 people found the review helpful, even though I don't believe the man had even seen the book. I thought the more honest reviews were more helpful. Negative reviewers noted that some of the content was not surname specific, the book was smaller than anticipated and the surname information was generic. I take this to mean they hoped to find genealogical information, at least some of which was specific to their line. I believe these statements will help set proper expectations for prospective buyers. One positive reviewer stated, "According to my Grandmother, the book is great. She is almost finished with it and she got it yesterday." Another gave it 5 stars, calling it a "fine book." (However, both reviewers added they would have liked more specifics.) I think the books are lovely and could make great Christmas gifts. I intended to do so until Ancestry Press came along and gave me the ability to publish my own, family-specific books. In February this year Ancestry added links to Family Facts from the joint Ancestry/RootsWeb message boards. The large number of "false positives" have caused a great number of complaints about the feature. Apparently, the feature works by comparing all words in the post against a word list. While Ancestry has made improvements, the feature still has problems and is still disliked by most users. Surprisingly, the surname links are not provided for the surnames specified for the message. For example, in a message on the Sider message board, the author specifies 3 surnames: Sider, Riley and Cadwell. Links are not provided in the surname list nor is the list used to disambiguate given and family names in the message body. This is just one example of how, in my opinion, Ancestry is missing a big opportunity to provide genealogical specific features in its message boards that would distinguish them from the generic messaging systems available from Yahoo, Google and others. But that's a subject for another time.